Reportedly founded about 1849 by a group of Englishmen who employed Chinese as miners, Chinese Camp was headquarters for stagelines in early 1850s and for several Chinese mining companies. Much surface gold was found on hills and flats. The first Chinese tong war in the state was fought here between the Sam Yap and Yan Woo Tongs. Stone and brick post office, built in 1854, is still in use. The St. Francis Xavier Catholic Church, built in 1855, was restored in 1949; its first pastor was Father Henry Aleric. 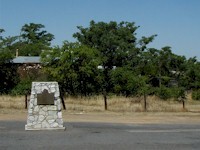 During a visit in the fall of 2002, it was noted that the post office described by the guide book is no longer in use and a new post office had been constructed on the north side of town. 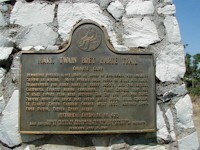 A closer view of the official state marker plaque.